Our neighbours on the two upper floors are at last getting their balconies again. 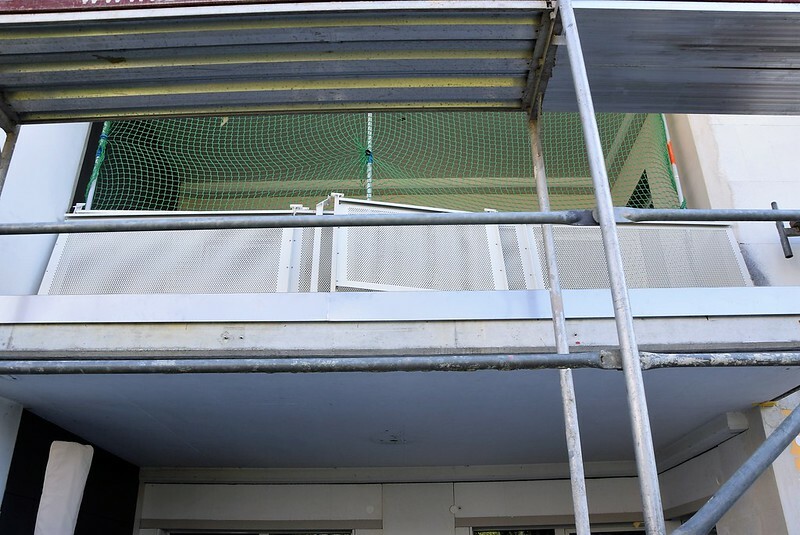 Yesterday a truck arrived piled up with the balcony gates and by the end of the day they were back in place. It is getting to look a lot like normal again, but the net remains at the moment. It seems that in a week or two one troop of builders will be leaving us forever as their work will be done with the first layers on the building. The painters move in afterwards to put the final touches and by the end of September we will be almost back to normal, but not quite. The scaffolding will probably remain into October and there will be some garden work to be done. Today is a holiday in the catholic parts of Switzerland, including our Kanton of Solothurn, for Asumption Day which says nothing to me. However, it is a quiet day on our building site and no-one will be disturbing the peace with hammers and other noise making machines. I can put my plants on the scaffolding again. It looks like a heat wave day, but this morning quite pleasant. Yesterday was a shopping day so as usual Mr. Swiss drove us to the supermarket and I was snapping a few photos on the way, there always seems to be something completely different to take a photo of. As we live in a catholic Kanton, the bishop of Basel (which is the next bordering Kanton) has his palace in our Kanton. He probably wanted to be fair to everyone. 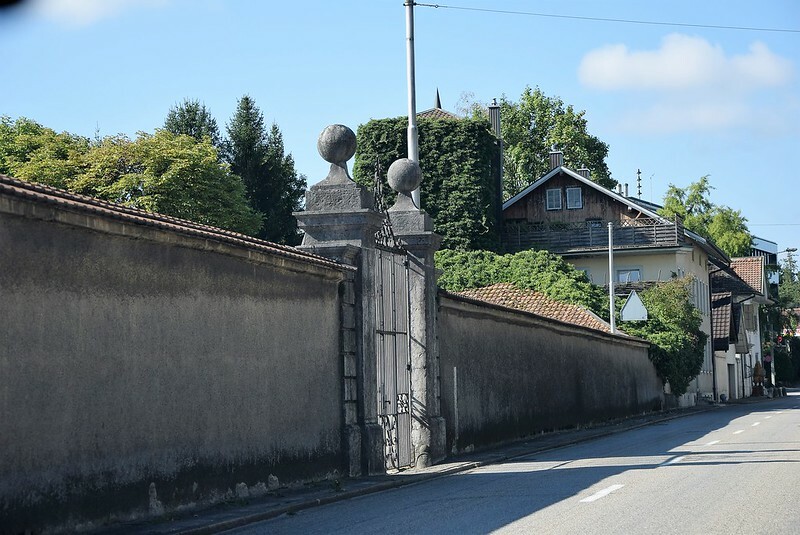 Of course he lives in a nice big mansion, but I only get a quick look when driving past and managed to take a photo of his main gates. We finished our shopping, thinking that today the shops are closed for the holiday. We piled our tropies into the car and Mr. Swiss said, in an after thought, “do you want to drive”. The thing is I never actually want to drive, it just happens now and again and I tend to say no when asked. However, it had been a couple of weeks since I last held the fate in my steering wheel hands. I said “no” at first, but at the last minute decided why not and so I drove all the way home. Basically all went well, although I almost took the wrong lane towards driving through town. Mr. Swiss corrected me and so we were back on the right road again. He continued to give instructions, and I continued to ignore him, I had a road to concentrate on. We arrived surprisingly safe home, although there was a slight misunderstanding when I parked the car. With a reverse from the parking place and a forwards correction, we were soon nicely parked. There were a few clouds hovering around at the top of the mountains yesterday, but otherwise it was blue skies. 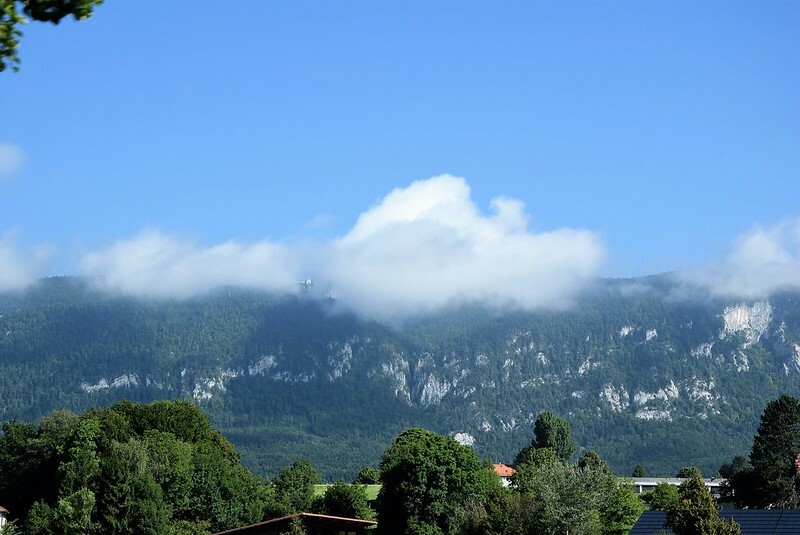 I could even see our house mountain “Weissenstein” restaurant peeking through the clouds at the top of the mountain. And now to enjoy the peace and quiet of today’s holiday. For me it is a normal golden oldie day, combined with the delight of an intensive clean of the bathroom to prevent boredom. I will plough on with my book “Game of Thrones”. Now everyone is having a battle but only 150 pages to go thank goodness and I will be finished with this epic boring book. Why am I bothering? Why not, at least I can say I did it when I have finished the book. Enjoy the day and be kind to your computers. I don’t bother with boring books anymore. If I don’t like it, I put it down and move on to something else. GOT was a sort of challenge for me. Everyone was praising the film series, but I decided to read the first book. I am glad I have, because I now know what it is all about and the rest of the books are nothing new. omg your description about your driving with mr Swiss is exactly like I and my Fiancé. We are exactly the same in that aspect, though I might be worse at directions and parking than you. This has all changed now. You never know what the future holds for you. Mr. Swiss no longer drives, he is no longer as fit as he was (will be 80 years old this year) and I have bought a new car for I, me and myself and I am now the driver. I drive almost daily doing the shopping and other chores and it works fine and he is glad that I have taken over. We are both handicapped. He has back problems and now and again uses a wheelchair and I have MS, but can still drive a car. I have to have an automatic as my left leg does not function very well, but it works well and I have peimission from my neurologist to drive. I also have a permit for parking spaces for handicapped. Mr. Swiss no longer voices his opinion and I know where to drive. I take injections every second day to slow it down and am managing OK. No-one really knows exactly when I had my first symptoms of MS, but probably I have had it for about 30-40 years, and slow progression than goodness. Apart from tiredness in the legs and a little giddy now and again, I am doing OK. thanks for your good wishes.